I have a long history with Strollers. Yes, Strollers with a "capital S". I love them. I have since before I had babies. I can't help myself. Hello, my name is Crissy and I'm a Strolleraholic. 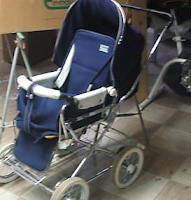 Today I was prowling around on the net and I found a photo of my first stroller, the Chicco 2002. Then I thought about it and realized, no, it wasn't my first stroller. My first stroller was a Baby Trend Snap-N-Go. Oh, wait, nope that wasn't my first, either. Then I smiled and counted up how many strollers I've had over the years. The current count is eight. 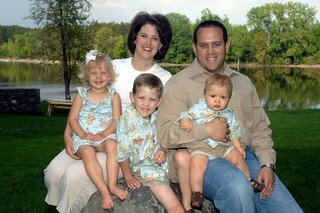 Eight strollers in almost nine years. Here was my first stroller, an Emmaljunga Viking. Actually, this isn't the actual stroller, but it looked a lot like this. And you could take the seat off the chassis and it had a bassinet that you could attach. Jack actually slept in that bassinet for the first eight weeks, or so. I bought the Viking before I was even pregnant. My neighbor was selling hers and approached me about buying it. I just knew I would feel like Mary Poppins if I could push that "old-fashioned perambulator" down the street. I wanted to have a baby just to have an excuse to take it for a spin. I talked John into buying it, since we would use the bassinet portion in our room and the stroller would last well into the toddler years. Plus, I just didn't really like the look of the "travel system" back then. They were all cream or navy and there were lots of teddy bears and the like. Just not really my cup of tea. When I did get pregnant, we made the pilgrimage to Babies'R'Us to register. Oh, to be shopping for the first baby again. We picked out the Evenflo "On My Way" infant carrier and John's grandmother generously bought it for us. I loved that infant carrier. It had a dark denim cover and the canopy was a really pretty dark blue and green plaid. That dang canopy never would stay up to block the sun, but that's another story. By the time we had Holly Grace, I just took the whole thing off. I remember that it was one of the only infant carriers at BRU that had a 5-point harness. Most of them just had a 3-point harness. As luck would have it, while we were at BRU, we saw the Baby Trend Snap-n-Go Lite (I think it was the "Lite") and thought that it would be perfect for the short period of time the baby would be in the infant carrier. 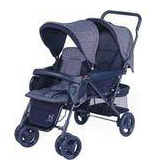 Ours looked way better than this one, though, because our carseat was navy blue and perfectly matched the Snap-n-Go. I always thought that white infant carrier with the blue Snap-n-Go looked tacky. Well, we brought our precious bundle home from the hospital and five days later took him for a walk to the gazebo that was near our little four-plex. It overlooked the harbor in San Pedro and the weather was gorgeous. (It was December, you know, in LA.) My parents were with us and I was livin' the dream, pushing my baby in his Emmaljunga stroller. Occasionally, we'd put him in that stroller, or "pram", and walk around the Base Housing area, which was really quite pretty, or we'd walk over to the "shopette", a little convenience store about 200 yards away, but the Snap-n-Go was what we kept in the car to use when we were out and about. Well, he outgrew the infant carrier at four months. Back then, the height limit on infant carriers was only 26" (much smaller than today). And besides, he was a FAT little baby and I really couldn't carry that thing around much longer. So we moved up to the Britax Roundabout we had received as a shower gift from my coworkers and thus began the loading up of the Emmaljunga in the car. That lasted about a day before I declared I needed a real stroller for this kid. Oh, I loved this stroller. I really wanted to get it, but it was about $160 on clearance at BRU, and I still felt like that was a lot to spend on a stroller (hah!). Really, though. I loved the colors, the seat was really cushy, the handles rotated 360 degrees (good for one-handed pushing). It had a five-point harness and a reclining seat. Strollers didn't really have cupholders then, so the lack of one wasn't really a hardship. Oh, and it was an umbrella fold and stood when folded. It was GREAT! I used and used it. Actually, my mom still has it at her house. I just couldn't bear to part with it. One of the best things about it was that we could sit our Britax Roundabout carseat in it, forward-facing, when we were going through the airport. And we traveled quite a bit when Jack was young. I never did understand why it was called the "2002", though. We bought it in 2000, and it was a 1999 model! Oh, how I came to hate this stroller. It seemed like such a good idea at the time because it could accomodate one infant carseat in the rear position, and Jack could ride as well. Plus, we'd had such a great experience with the Snap-N-Go. But it was so very, very heavy. Caravan Lite? Not so much. To lift it in and out of the car was just misery. I just didn't have many options, though. I wanted to get a Sit-N-Stand, but if you used it with an infant carrier, there was no place for the older child to sit or stand, which kind of defeats the purpose, right? So I dealt with it until I felt like Jack could just walk and I went back to my beloved Chicco for Holly Grace. Also somewhere in there we acquired one of these. I believe that a friend of ours gave it to us when she made a $20 purchase at BRU and got it for free. That should say a bit about the quality. I have to say, however, we still have it and pull it out when the car is packed full and we still need a stroller (it fits between the seats, on the floor); we've also taken it through the airport when our nice big stroller is all packed away and checked through. It's a good stroller for going through security. Unfortunately, in order to steer it, you have to tilt it backward since the front wheels don't really roll very well. A disadvantage in a stroller, to be sure.